Updates on 2016 Preakness Stakes Horses: Reddam Racing LLC’s Nyquist galloped a strong 1 ¼ miles at Pimlico Race Course Thursday morning in preparation for Saturday’s 141st Preakness Stakes (G1), continuing to impress trainer Doug O’Neill with the high level of energy the 3-5 morning-line favorite has demonstrated since capturing the Kentucky Derby (G1) May 7. Koji Maeda’s Lani arrived at Pimlico at 8:55 Thursday morning following a van ride from Belmont Park. O’Neill was joined by jockey Mario Gutierrez on the press box porch to watch Nyquist’s final serious tune-up for the Middle Jewel of the Triple Crown with just a jogging session slated for Friday morning. Four years ago, Gutierrez visited Pimlico for the first time with I’ll Have Another, aboard whom he followed up a Kentucky Derby victory with a narrow victory in the Preakness Stakes for owner J. Paul Reddam and O’Neill. Gutierrez has been riding in Southern California since his triumph in the 2012 Preakness, gaining experience and fine-tuning his career. Through good and bad times, Reddam and O’Neill stood by Gutierrez, who enjoyed his best year in 2015 aboard the winners of 104 races and $6.3 million in purses. Gutierrez has been aboard Nyquist for all eight of his races, all victories. Despite having only two weeks to bounce back from his Kentucky Derby score, Nyquist is instilling confidence in O’Neill that he will be ready for the challenge Saturday. EXAGGERATOR – Keith and Kent Desormeaux fell 1 1/4 lengths shy of becoming the first trainer-jockey brother combination to team to win the Kentucky Derby, with the late-running Exaggerator finishing second to unbeaten Nyquist. Two weeks later, the Desormeauxs can achieve that first in the Preakness, which has the added dimension of being in Maryland, where both brothers really launched their racing careers. Keith, who first came to Maryland as a college student looking to gallop horses as a summer job, was an assistant trainer to the highly respected Hadry for several years before going out on his own for good in 1990. (He also had some horses racing in his name in 1988). Vance is now based in Kentucky and his longtime winter base of Oaklawn Park, but back then he raced in the summers at Louisiana Downs, where Kent Desormeaux was riding as a new apprentice. Instead, Kent Desormeaux set a record of 450 wins that year en route to being the Eclipse Award-winning apprentice jockey, which he followed with 471 in 1988. In 1989, riding in Maryland during the day and Penn National at night, Desormeaux took dead aim on the national win record, which he would shatter with 598 victories to clip Chris McCarron’s 1974 mark of 546. While driven to get the record, Desormeaux still made a significant sacrifice: He took a rare couple of days off that spring to attend the graduation of what would have been his class at North Vermillion High School in Maurice, La. Desormeaux had earned a GED from Airline High School in Bossier City, La., where Louisiana Downs is located. Exaggerator, however, did walk. The Derby runner-up walked 30 minutes around the shedrow, a common routine on a Thursday for a Keith Desormeaux-trained horse. The son of two-time Horse of the Year Curlin will resume training Friday. ABIDING STAR – Stonehedge LLC’s Abiding Star arrived at Pimlico Race Course Thursday around 8 a.m. following a van ride from Parx Racing in the Philadelphia area. Abiding Star was accompanied by Always Sunshine, rated second at 7-2 in the morning line for Saturday’s Maryland Sprint Handicap (G3). Both Allard trainees are stabled in Barn 1 in the stable area along the backstretch at Pimlico, far away from the Preakness Stakes Barns in the stable area behind the grandstand. 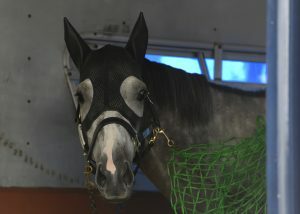 Abiding Star and other healthy horses that shipped from Parx, where a quarantine for equine herpesvirus was lifted Tuesday, are scheduled to train between 5 and 5:30 a.m. Friday prior to the regular training session that starts at 6 a.m. Allard was highly complimentary of Pimlico management’s special precautionary measures and accommodations for his horses. Abiding Star, one of four sons of Uncle Mo in the 11-horse field, is riding a five-race winning streak, including the Parx Derby May 7. AWESOME SPEED – Colts Neck Stable’s Awesome Speed was the final Preakness entrant to arrive on the grounds at Pimlico when his van pulled in shortly before 11 o’clock from New Jersey Thursday morning. Accompanied by assistant trainer Jorge Duarte, who will handle the program here for trainer Alan Goldberg, the son of Awesome Again settled into Stall 17 in the Preakness Stakes Barn. All Preakness runners needed to be on the grounds by noon. The Federico Tesio winner was one of two Goldberg-trained horses on the van from Colts Neck. The other, Top Sheet, is entered to run in the second race Friday. Goldberg has four horses scheduled to run Saturday. With rain forecast for Saturday, Goldberg said Thursday he was more concerned about the weather’s effect on his grass runners scheduled to run in Races 2, 4, and 12. 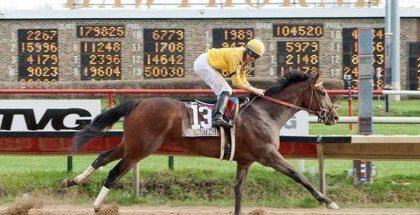 Awesome Speed won the Tesio via disqualification on a track labeled ‘good’ at Laurel on April 9, earning an automatic berth in the Middle Jewel of the Triple Crown. Awesome Speed drew Post 4 on Wednesday, right between Derby winner Nyquist (3) and runner-up Exaggerator (5), which Goldberg said shouldn’t be much of a factor. Nyquist is a front-running type while Exaggerator likes to come from well off the pace. Jockey Jevian Toledo rides the three-time stakes winner for the second time. CHERRY WINE – If Cherry Wine could pull off the upset in Saturday’s Preakness Stakes, it might be the most emotional victory in trainer Dale Romans’ career. That’s because he goes way back not only with Cherry Wine’s owners but also with the colt’s family. “It would be a family affair for everybody,” Romans said Thursday morning at Pimlico. Cherry Wine is owned by breeders William Pacella, Frank Jones and Frank Shoop. Romans has trained for Pacella for 20 years, and Jones has known Romans literally from the first day the trainer was born. Jones has had only two trainers in his decades-long ownership tenure, the first being Romans’ late father, Jerry. Jones called Dale Romans his adopted son, and their personal bond transcends their business relationship. Romans goes back three generations with Cherry Wine, who, like sire Paddy O’Prado, is gray. He bought Sweeping Story privately for client Ron McKee for $70,000 after her second start. The filly, a half-sister to Metropolitan Mile (G1) winner Exciting Story, went on to win two stakes and finish third in the 1999 Kentucky Oaks at 57-1 odds. “We were selling babies out of her,” Romans said. “The first one sold for ($330,000), the second for $800,000. C. S. Royce came along. Ron was getting out of the business, and I bought her for the Pacellas and Frank (Jones). Cherry Wine was born on Romans’ Lexington farm, previously owned by McKee and where C.S. Royce was foaled. Cherry Wine is her first foal. “He was born in my backyard,” Romans said. “He’s like one of my children. “He’s got a little Paddy O’Prado personality about him. Paddy was the most personable horse I ever had. He was curious about things. He would holler and scream at other horses –never mean. He’d holler at people when they came into the barn, like he wanted them to come visit with him. And this horse is inquisitive. He’s not quite as verbal as Paddy. Paddy O’Prado, who went on to be a Grade 1 winner on turf, finished third in the 2010 Kentucky Derby in the slop, then was sixth in the Preakness. His son was third in this year’s Blue Grass (G1) at Keeneland but missed making the Kentucky Derby on points. Cherry Wine schooled in the starting gate before galloping 1 ½ miles under Faustino Aguilar. Romans watched the session on the Pimlico press box balcony, where Doug O’Neill was watching his unbeaten Kentucky Derby winner Nyquist train. COLLECTED –With rain in the forecast for Saturday, trainer Bob Baffert spent some time Thursday morning talking about the intense storm that struck Pimlico just prior to last year’s Preakness. American Pharoah relished running on the wet track and he easily won the Preakness on the way to becoming the first Triple Crown winner in 37 years. Baffert said his young son Bode, is something of a weather geek and was paying attention to the storm as it approached the track. Baffert said his wife, Jill, scolded their son about flirting with bad luck by talking about winning before the race was run. “She said ‘Not now, Bode. We don’t go there. We don’t talk about that,’” Baffert said. Baffert said he did take his son’s advice, saddled American Pharoah and Dortmund quickly and headed for cover in the paddock. Baffert said that a wet track on Saturday might have an impact on the race, though he noted that Pimlico’s track handles rain well. “It’s not going to affect Nyquist,” he said. “It will affect half of the field. The winner is either going to be completely clean or completely, really dirty. I think my horse definitely has to be up there in the front. There is so much speed. There is quality speed. Uncle Lino is quality, my horse is fast and you’ve got some other horses that could be fast. Since he arrived in Baltimore this week, Baffert has been asked to compare how it feels to come to the Preakness with a new shooter like Speedway Stable’s Collected and last year with the Derby winner. Someone wondered if it felt weird. “I’ve come in here a little weird many years,” Baffert said, laughing. “I know what it feels like. I’ve been through it so many times. Baffert, 63 and a heart attack survivor, said he never thought about retiring after American Pharoah took him to the promised land last year by winning Triple Crown. He joked that winning a huge lottery might send him to retirement, but he has no plans to leave the business. “I really enjoy it,” he said. “It’s still fun to compete. It’s fun to come here. This is why we do it. I’m a competitor. The juices are still flowing. We come out here and watch the horses train and watch the new horses coming in and wondering which one is going to be the next star. I would go crazy if I didn’t train horses. I would go nuts. I still have a few to go. FELLOWSHIP – Jacks or Better Farm’s Fellowship galloped 1 ½ miles over a fast Pimlico racing surface Thursday morning under exercise rider Brian O’Leary. Norman Casse, assistant to his father Mark, said Fellowship is penciled in for a paddock schooling session with Thursday afternoon’s third race but may pass on the opportunity. Fellowship came into the Casse barn at Churchill Downs a month ago and that is when O’Leary first teamed up with the Florida-bred son of Awesome of Course. O’Leary, who previously worked for Aidan O’Brien and Eddie Kenneally, was sold on Fellowship after their initial outing. “I told Norman that I really liked him,” O’Leary said. LANI – Koji Maeda’s Lani arrived at Pimlico at 8:55 Thursday morning following a van ride from Belmont Park. Lani was housed in an isolation portion of Barn B. “He will have half a barn to walk in, which is about the same as what he had at Churchill Downs,” Tanaka said referring to Lani’s housing during his five-week stay in the stakes barn in Louisville, where he ran ninth in the Kentucky Derby. Lani had shipped to Belmont Park on May 9 and completed his major Preakness preparation there with a five-furlong work in 1:01.50 on Wednesday. Trainer Mikio Matsunaga said Lani would go to the track Friday morning between 7 and 9. “He may go around one time or two, but he will go to the gate to stand,” Matsunaga said, adding that Lani also would go to the track Saturday morning to train the day of the race as he did in Kentucky. Jockey Yutaka Take was scheduled to arrive in Baltimore Thursday afternoon. LAOBAN – McCormick Racing LLC and Southern Equine Stable’s Laoban galloped a mile and schooled at the starting gate Thursday morning at Pimlico. Laoban has run his last four races with blinkers after a nondescript debut race at Del Mar last fall without the hood. He ran second in his subsequent start and has since finished third, second and fourth in graded-stakes races with blinkers in place. He will enter the Preakness starting gate without cover and with new rider Florent Geroux aboard. Guillot said that with the weather forecast of a possible day-long rain, it makes even more sense to go blinker-less. Geroux, who has already won 16 graded stakes this season, became available for his first Preakness mount after Gun Runner was declared from Preakness consideration Tuesday. Exercise rider Clay Courville was aboard for Thursday morning’s exercise. “He galloped with authority today,” said Guillot, who admitted to a smattering of mixed emotions about facing Nyquist in the Middle Jewel of the Triple Crown. Nyquist is 3-5 in the morning line, Laoban was listed among the longest shots at 30-1. If Laoban prevails Saturday, he would not be the first maiden to win the Preakness. Research this week by Allan Carter, historian at the National Museum of Racing and Hall of Fame in Saratoga Springs, N.Y., shows that the Preakness was won six times by maidens prior to 1910: Survivor (1873), Culpepper (1874), Shirley (1876), Cloverbrook (1877), Saunterer (1881), and Refund (1888). “We’ve been second, third and fourth in graded stakes,” he said when asked if Nyquist and Exaggerator stood above the field here. “They’ve all got four legs and a tail. It’s never a two-horse race. Go back and look at Guillot’s history in big races. I’ve won 23 graded stakes and 11 of them paid over a $25 mutuel. Apparently I didn’t have a chance in those 11 either, right? Laoban will be Guillot’s first starter in a Triple Crown race. STRADIVARI – Stradivari, who comes into the Preakness off a 14 1/2-length allowance victory at Keeneland, arrived at Pimlico on a Brook Ledge horse van shortly before 8 a.m. Thursday, having made the four-hour ship from Belmont Park. Now he’ll try to match Bernardini in 2006 by winning the Middle Jewel of the Triple Crown in his fourth lifetime start. Stradivari is the 8-1 third choice in the morning line, with John Velazquez aboard for trainer Todd Pletcher. The Gunthers offered the Medaglia d’Oro colt, who is out of their American Chance mare Bending Strings, for sale at Keeneland’s 2014 September yearling auction, but the top bid of $335,000 did not meet their pre-determined minimum price. Stradivari finished fourth in his first start sprinting, then won a 1 1/16-mile Gulfstream maiden race by 11 1/4 lengths. “We were a bit wowed by that race,” Gunther said. “Even more so when he won the allowance the way he did. To win that way at Keeneland, you just don’t see that very often with any horse, never mind one you bred and raised and are racing yourself. Johnny V. barely asked him. I think he just kind of let the rein out a notch and off he went. After the maiden victory, the Gunthers sold part interest in Stradivari to Michael Tabor, Derrick Smith and Mrs. John Magnier, who are associates of the international Coolmore stallion and breeding conglomerate and have a lot of horses with Pletcher. The Gunthers also board broodmares at Coolmore’s Ireland operation. Pletcher said he was thinking early on about how to best get Stradivari to the Kentucky Derby, a goal that changed to the Preakness after a minor setback kept the colt from racing again for 4 ½ months, until the April 17 allowance race at 1 1/8 miles. Gunther said the trainer took the lead in targeting Triple Crown races. Under the best of circumstances, jumping from entry-level allowance to the Triple Crown is a lofty challenge. But this Preakness features an unbeaten champion in Nyquist. “We’re crossing our fingers, toes, arms, legs,” Gunther said. “In terms of coming up against a horse like Nyquist and Exaggerator and these many good horses, it does make you get a bit nervous inside. None of us has a crystal ball to say how he will do. We’re just very hopeful. We think he’s talented and it’s worth trying. UNCLE LINO – Members of the small Uncle Lino entourage posed for photos with the colt outside the Preakness Stakes Barn Thursday morning as co-owner Tom Mansor explained how the son of Uncle Mo was named after his favorite uncle, the late Lino Luigi Cenini, his mother’s brother. Mansor and Jim Glavin, who operates as Purple Shamrock Racing, are partners in the colt with trainer Gary Sherlock. Mansor, 74, and Sherlock, 70, are the sons of jockeys and have known each other since they were kids growing up in Pleasanton, Calif. Mansor returned to the racing business a few years ago and Sherlock was one of the trainers he began doing business with. In September 2014, Sherlock picked out a yearling son of the first-crop sire Uncle Mo to run with Mansor. They paid $52,000 for the colt and later sold a third to Glavin. When it came time to name the promising colt, Mansor and his partners decided that Uncle Lino would be a good fit. Lino Cenini died at the age of 84 in June 2010 in Palm Desert, Calif.
“When I was young, my dad was a jock and traveling, so they put me in a private Catholic military school in the San Mateo area,” Mansor said. “Lino would come every so often and get me out for the weekend. He was my uncle, my father, my brother and good friend, the whole bit. Mansor made his living in medical sales and now –10 years after he “retired” – says he is working seven days a week with his medical-related services company, including a lab in Arizona. Uncle Lino was gone, but not forgotten when Mansor started buying Thoroughbreds again. Uncle Lino has three graded-stakes placings, including a third in the Santa Anita Derby (G1). The speedy colt won the California Chrome Stakes, named after the 2014 Derby and Preakness winner, on April 30. That performance convinced Sherlock, Mansor and Glavin to run in the Preakness. 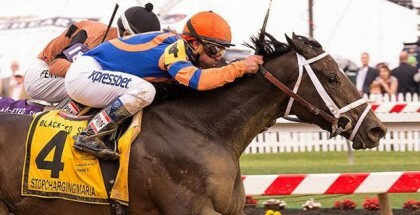 Jockey Fernando Hernandez Perez, his regular rider, will be aboard for the Preakness. Sherlock said Uncle Lino has settled in well since shipping from California on Tuesday. He went to the track for the first time Thursday and galloped a mile.